One of the most sought after trails in all of Colorado, and for good reason. While Engineer Mountain could (and does) stand alone—an elegant bachelor begging to be tamed—the quick, two mile approach to this mountain’s flanks is a tantalizing foreplay of singletrack. 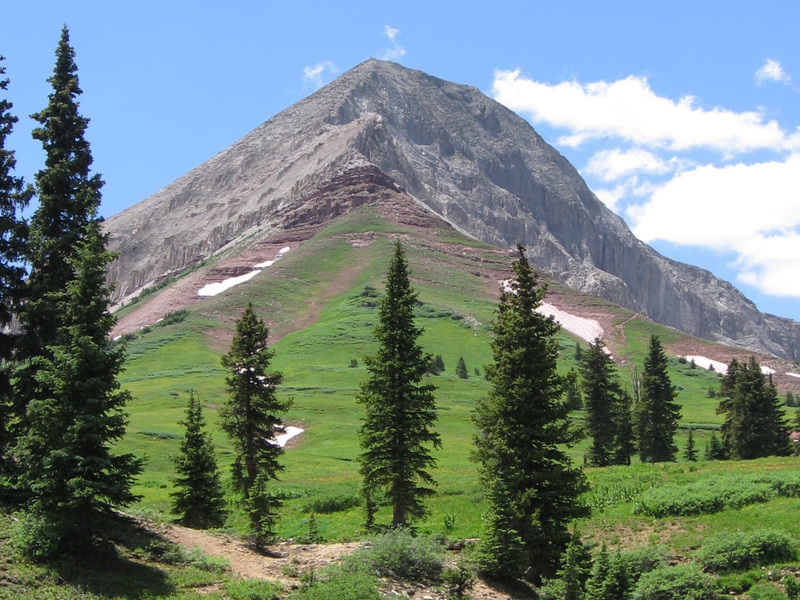 Engineer Mountain is one of the most sought after trails in all of Colorado, and for good reason. While Engineer Mountain could (and does) stand alone—an elegant bachelor begging to be tamed—the quick, two mile approach to this mountain’s flanks is a tantalizing foreplay of singletrack. With lush fields of cornflowers, soft spruce-fir forests and rare rock glaciers, Engineer Mountain is not only exciting, Durangoans believe it is the sexiest place on earth. The tundra slopes sliced by Engineer trail are the finest of the San Juans. Teeming with wildflowers and panoramic views of near and distant peaks, running this trail will feel like a dream you never want to wake up from. From the trailhead to the summit it is a 2,270 foot climb, but the first three miles are gentle, soft, and loping singletrack—a must-do experience for all abilities, with multiple lakes to stop and take a breather or skip a rock. The final push up the double-tiered northeast ridge can be a little dicey due to exposure, but you wouldn’t know it from the crowds. It’s as if inspiration takes hold of everyone who comes to the foot of this mountain, beckoning them to the top despite reason or a little fear of heights. Trailhead access is so easily acquired from the beaten path that you will be amazed to find yourself quickly ensconced in an ancient landscape, with dramatic cliff sides carved out by prehistoric glaciers. The rock glacier on the backside of Engineer Mountain is one of the more impressive geological sites in the area, making this one of the more stunning mountains in Colorado. Even runners afflicted with the worst ADD imaginable will not get bored on this ever-changing route. Meadows with wildflowers, dense forest speckled with lakes and mountain tundra abloom in blasts of green—sensory overload is the main concern. Those looking for a run on soft singletrack will love this quick out and back to the ridge, while the adventurous type looking for some scramble-time will continue onward and upward, enjoying the airy, rocky push to the summit. Drive 33 miles north on Hwy 550 to Coal Bank Pass. Just past the top of the pass there is a quick left turn (it’s easy to miss so slow down once reaching Coal Bank) into a dirt parking lot. There are no facilities, but there is a pit toilet back at the top of the pass, which, unlike the turn into the trailhead parking lot, can’t be missed. The trail begins from the northwest corner of the parking lot, through wildflower meadows and into the trees. After 2.5 miles the trail T-bones and there is a sign for Engineer Mountain Trail. Head straight up, noticing a large boulder called “Social Rock.” This is the picnic spot and turn-around point for any runners with vertigo. For those continuing to the summit, keep pressing higher. The crux of the climb is after the first distinct ridge, in a chimney. It seems logical to pop up through the chimney, but with the extreme exposure it is best to bear left and skirt the chimney to the west. There are no rock climbing moves but this scramble has severe consequences, so remain in three points of contact at all times. The summit has a rock wall for windblock and views that will make your heart sing.